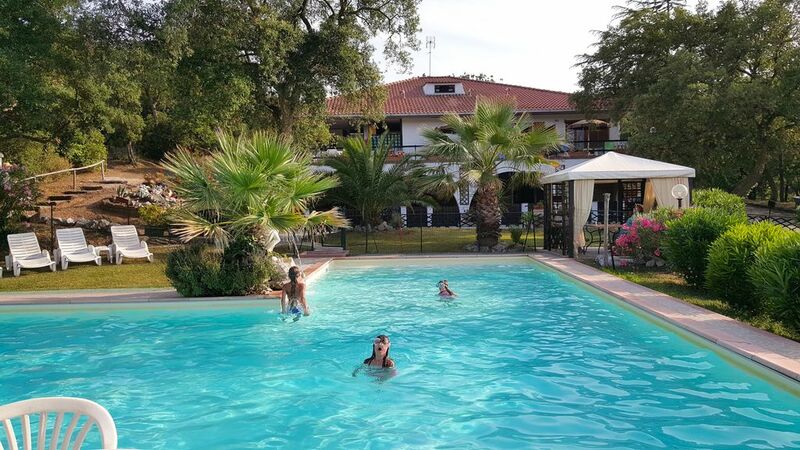 In Toscana, a Campiglia Marittima che offre appartamenti per vacanze al mare, completamente immerso in 3 ettari di parco naturale con un 15 x 12 m piscina e parcheggio privato. Disponibile per tutti sono: barbecue e gazebo, ping pong e TV SAT. Il residence dispone di un moderno appartamenti arredati e dotati di 2 stanze di 40 mq con ingresso indipendente, camera matrimoniale, bagno, soggiorno con divano letto e cucina. L'appartamento villa dispone di 160 mq su due piani, elegantemente arredate in stile toscano, con ingresso indipendente, ampio soggiorno con bella scala, grande camino, angolo cottura e divano letto matrimoniale, due camere da letto al primo piano, 2 bagni per piano e una terrazza con sedie a sdraio e tavolo. Studios con ingresso indipendente composto da letto matrimoniale + letto singolo, bagno, angolo cottura e tavolo privato e sedie a sdraio di fuori. E due ville indipendenti. "Lovely peaceful location next to a charming medieval town and within easy driving distance of sandy beaches. The swimming pool is fantastic and well maintained, and the owners friendly and helpful. Wi-fi Internet access is available (if a little temperamental). The apartment, although small, is well equipped, with the only drawback being the rather musty smell in the wardrobes. All in all, well worth recommending." Un super séjour en Famille en Toscane ! Merci Stefano et Alessandro pour votre accueil et votre gentillesse. L’appartement pour 8 est très bien. Les enfants et les parents ont adoré la piscine. La maison est idéalement située pour visiter la Toscane (Pisa, Lucca , Firenze, Siena, San Gimignano, Campiglia Marittima....) ou aller à la plage ( golfe de Baratti, Populonia Bucca del Fare pour la balade et la plongée, les plages de Biambino et le restaurant de poisson la Baracchina. En conclusion de superbes vacances en Italie. Overall well-kept residence with nice pool and very hospitable owners. - Different from what the description suggests, we found it to be not enough space and comfort for two families: only 2 sleeping rooms and the bathrooms are separate, everything else is open - including the mini-kitchen. Lots of space in the apartment is being taken by very large open - also a bit noisy - staircase. - the third double bedroom was only a very very small open cabin with bunk beds - too small for children >10years . Our teen kids had to sleep in on the bed couch in the open living room, where everybody had to cross to the bathroom/kitchen/terrasse etc. - the two double sleeping rooms in the second floor are connected to a large roof terrace with absolutely no sun protection. It couldn't therefore be used during the day. At night, the heat was entering the bedrooms. The owners supplied a fan - but the sleeping rooms would need a real air-con to be comfortable in hot season. - The kitchen was miniscule and different from what we had expected seeing the apartments pictures. Overall a bit disappointing experience. Nevertheless we found Stefano and Alessandro very nice hosts and trust them to improve some of the points mentioned. - the description of the house is very accurate is twenty years that i have the same description and all the guests are always happy with dozens of beautiful reviews ... two bedrooms with double beds, a small room with 2 bunk beds where they can sleep even adults being 2 normal single beds and a double sofa bed in the living room ... in the private emails that we exchanged with Mrs.Muriel I had written very precisely the description of the rooms and She had understood very well..but despite the Suite is very nice She wanted a house with 4- 5 bedrooms paying the same price as one of 2-3 bedrooms. - in the rooms we have a lot of fans we bought 1 more to please them but we will put the air conditioning and big umbrellas for the next season so Mrs.Muriel hope returns. - the kitchen is a kitchenette containing a complete kitchen-standard with 4 fires..fridge, freezer, owen and more. -the outdoor tables and chairs are not plastic but polycarbonate to last for a long time outside. I hope to always get better and have Mrs. Muriel as our guest again in the future. The property site was well managed & clean the pool was a delight especially on hot days. The location provided us with the opportunity to visit local medieval hill top towns, including a short walk to Campiglia which has a great variety of restaurants and the people are friendly. Our apartment( the largest) was spacious more so than we had anticipated. The apartment was again clean, with bedlinen & towels provided. We loved having a variety of places in the apartment to eat; indoors at the large dining table; outside on a large garden table; or our favourite place the large balcony with views across the woods and towards the sea. Alles was man für einen Urlaub braucht! Ruhige Lage! Küche könnte etwas besser ausgestattet sein! Camiglita Maritima Ca. 2 km entfernt, hat alles Bäcker, Restaurant ..
Residence Oasi nel cuore della Costa degli Etruschi offre la possibilità di scegliere tra una vacanza al mare: la spiaggia di sabbia di San Vincenzo e Rimigliano parco attrezzato con area pic-nic e la spiaggia pubblica e molto vicino al porto di imbarco per l'Isola d'Elba. Si tratta di una vacanza storico culturale, visitare i siti storici locali: Campiglia M. MA, San Gimignano, Volterra, Pisa, Siena, Firenze e Roma. Golf: Hai 2 mazze da golf nella zona. Circa 25 km dal Residence.